Packaged and sealed water tight in a PVC tube. It fits into backpacks more easily, and uses less space. 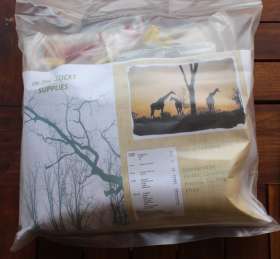 This Plastic bag can serve as a carry-bag in the field for water, fruits, any items collected in the bush. All the smaller items inside the bag has been packaged in Zip-Lock re-sealable bags for protection against moisture or sand ingress. A sheet of paper has been included as an item in the bag, and could be utilised for leaving notes, marking positions in the bush, assisting in making a fire to name a few. A Gel fuel cannister as main heat source. contains plastic tubes sealed at one end, that can be used to mix your powdered drinks, or to be used as water collection satchels. Weight per pack: Approximately 1.3 kg. Shelf life is dependent on individual items contained in the pack, ambient temperature and lighting also play a role, but could up to 2 years. Some items may contain nuts, or may have been packaged where nuts are processed. I am interested in the "24 HR Ration Packs".